These workshops are held annually for the purpose of preservation and utilization of Japanese art objects, such as paintings and calligraphic works overseas, and promotion of the understanding of these objects. 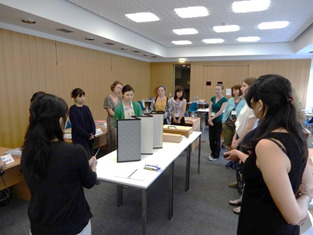 This year, the basic course “Japanese Paper and Silk Cultural Properties” held from July 4th to 6th, 2018, and the advanced course “Restoration of Japanese Hanging Scrolls” held from July 9th to 13th were conducted at the Asian Art Museum, National Museums in Berlin (Museum für Asiatische Kunst, Staatliche Museen zu Berlin) with the support of the Asian Art Museum and Museum of Technology (Deutsches Technikmuseum). In the basic course, 13 restorers, conservators and students from ten countries participated. This course consisted of lectures, demonstrations, and practical work that covered the process from the creation of a cultural property to its appearance before the public, that is, its creation, mounting, exhibition and viewing. Participants were lectured on the materials used for the cultural properties, such as adhesives, mineral pigments and paper, and participated in the practical work of painting on silk, Chinese ink painting and handling of hanging scrolls. In the advanced course, instructors from a certified group that holds the Selected Conservation Techniques dubbed “Restoration techniques for mounts” conducted practical work sessions and lectures to ten restorers from six countries. The instructors demonstrated techniques such as lining and reattachment of roller knobs, and the participants experienced the removing and attaching of the rods of a hanging scroll during the practical work sessions. Through these sessions, the participants could gain an understanding of the structure of hanging scrolls and knowledge and techniques for the restoration of hanging scrolls. Discussions were actively held in both courses. In addition to a question and answer session, opinions about restoration and applications of Japanese techniques and materials were exchanged. Similar projects will be implemented with the aim of contribution to the preservation and utilization of Japan’s tangible and intangible cultural properties overseas by sharing information about conservation materials and techniques in Japan with conservators overseas.